Patty Laurel-Filart, Oster Philippines and myself have been planning this event for weeks as an activity to launch my blog! 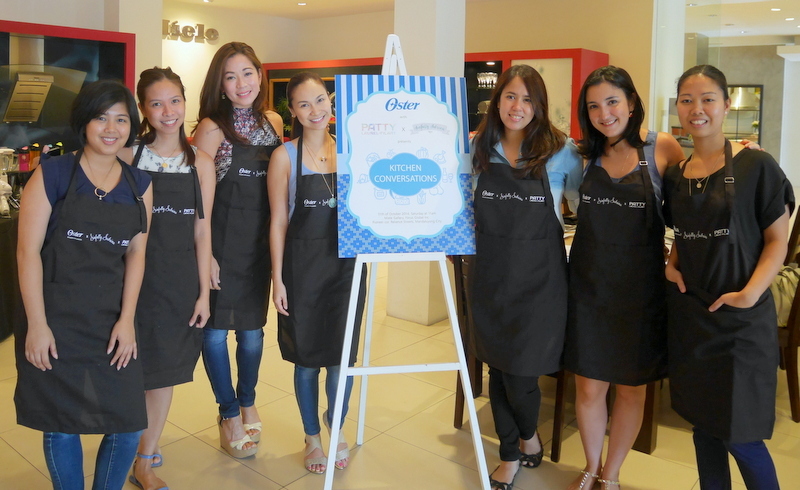 Oster Philippines hosts Kitchen Conversations at least once a month and they were kind enough to include Patty and myself in their roster. With my beautiful girlfriends! A photo before the cooking commenced (Para fresh pa! Haha!) Most of us were from DLSZ so we go waaaaayyyy back. From left to right: Aby (my sis-in-law and awesome photographer! ), Kathleen (Event stylist extraordinaire! Message me if you want her contact details), Monica (Best friend for over 20 years), Patty (High School classmate and friend for over 10 years), me, Kat (Best friend since kindergarten, partner in crime), Joanne Mercado (Brand Manager of Oster Philippines), Joei (Lawyer, blogger (Joei and Me), high school batchmate and friend for about 15 years) not in this photo but will be seen in the other photos below. What a great time to catch up, cook and have a good meal with these terrific ladies! Kathleen in the background, working on the lovely table set-up. Thank you Kathleen!!! 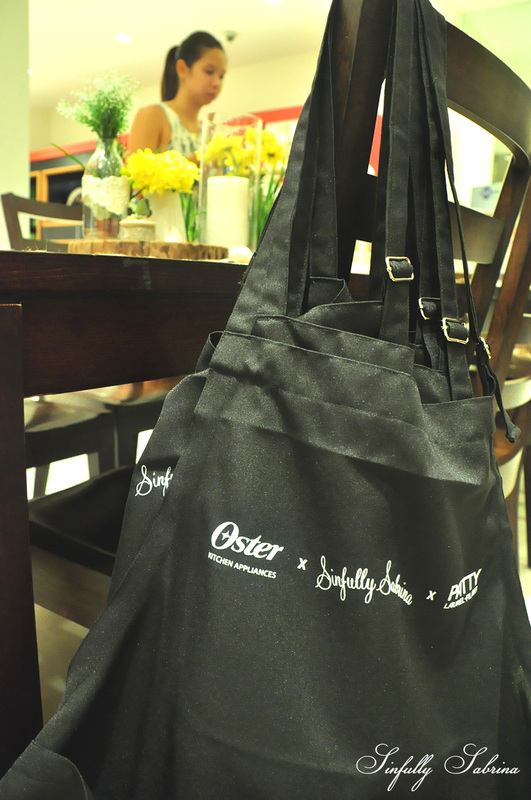 And these cool aprons made by Oster that we all took home! A shot of the very colorful mise en place. Just a few of the amazing Oster products we were going to use throughout the cooking session. Recipe booklets made by Oster! And here's Patty introducing Joanne Mercado, brand manager of Oster Philippines. 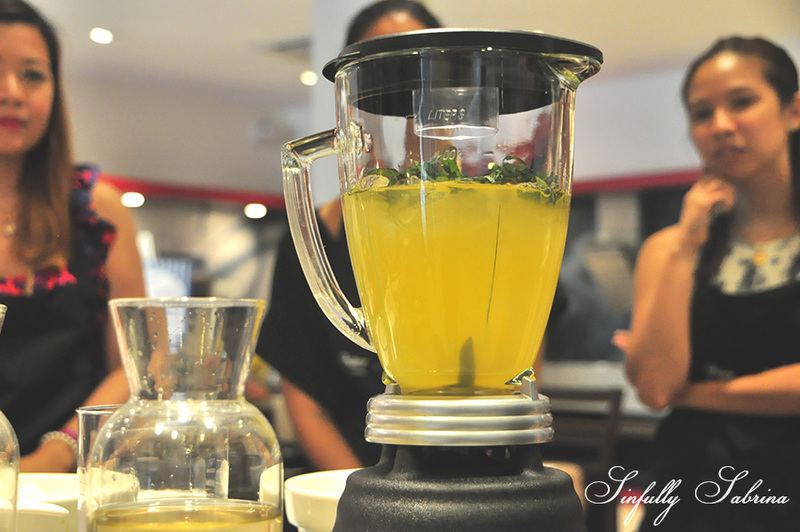 The girls looking intently at the Oster Blender cause they were super excited for the Calamansi-Basil Slush! We are the Tres Marias! Haha! We were so surprised that we could make Paninis AND grill our veggies on the same Oster Double Contact Grill. And that's Patty rockin' the grill, of course I made them work for their lunch a little bit. 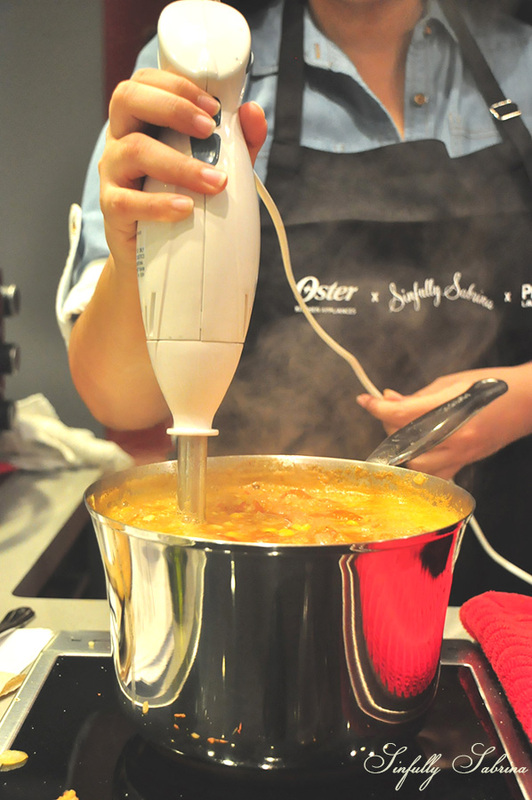 Using the Oster Stick Mixer with Chopper and Whisk to make our Roasted Corn, Tomato and Pepper Chowder! Again, using Oster's Double Contact Grill to make parmesan crisps! Oster's Multi-Use Rice Cooker is going to make our One-Pot Creamy Chicken Rice! You can leave it behind and it'll do the cooking for you while you make the other dishes. Joei (click on her lovely blog Joei and Me for travel tips and restaurant finds) helping me get started with dessert, Sweetheart Eclairs together with Aby and Kathleen. The Oster Oven Toaster baking our eclairs. We were all in a hurry to take this photo so we could finally sink our teeth into the eclairs! Surprise! As if we weren't spoiled enough, Oster gave each of us a gift! Yey!!! For more information on Oster Philippines Products, visit their website. Thank you Patty Laurel-Filart!!! Patty's post about the event on her blog, click here. Oh, and I'll be posting the recipes on Part 2!